Random thoughts as they appear… only in memories now. As this entry is posted, it’s been 43 years since the fateful night. But the heart and soul know no time, and images rest deep in the recesses of the mind. Some things never cease as long as the heart continues to beat and lungs continue to draw breath. Today, the music still plays, the people continue to dance, the conversations continue round and about, and the love holds firm, fast and steady in the heart. Thank you George… infinitely and eternally. Click on the images for full-size view. 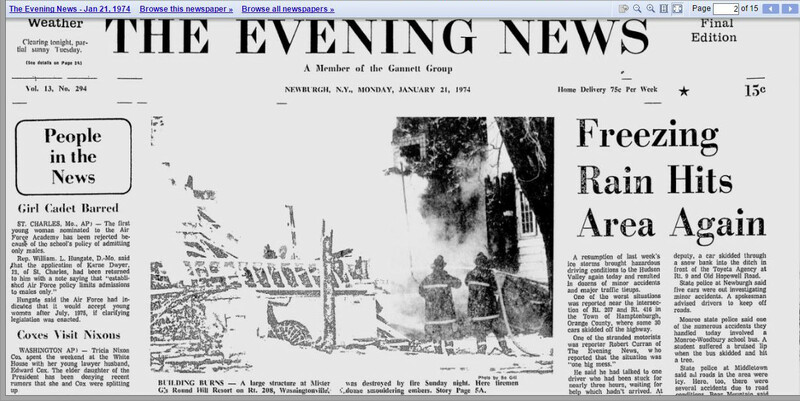 I can’t believe that it’s been 44 years since G’s was torched to the ground. The memories of those nights, the days, watching the sun rise over the hills, the first light of the morning reaching into the room through the large windows, touching the old piano, all the details still so vivid. The “Main House”, quiet, still, the guests asleep after a night of dancing and enjoying everybody’s company. Whether we’d met or not, we were all “family”. We shared the joys and sorrows of every-day life, in one way or another, drinking, dancing or just strolling around the meadow, maybe down the wood-land path to the pool. Romances were born, some died, and yet others were re-kindled. But the most important point was that we were all there, together, friends, lovers, strangers, none of that made any difference. And as for the “strangers”? That didn’t last long. It didn’t take but moments for even the newcomer to become “family”. 44 years and I can still see Brenda and Pat Rainey dancing to “Love Train”, George at the bar, and I can still hear Jasper’s bangles counting the beats, accentuating the rhythm of the songs playing on the juke-box. There’s been hardly a day that passes over time when I haven’t wondered how many of us are still remembering with me, over the miles and the years. I’ve learnt that many of us are “gone” now, all too many of the “regulars”. Time… it takes us away, apart, but it also leaves behind some who, like me, keep the memories alive, strong, deep, vivid, in mind, heart and soul. One day, I know, I’ll pass along, out into time and space, and I’ll take with me, all my own memories. But I’ll leave behind, this little memorial, hoping that if there’s a “place” we “go to” after this life, for me, that place will be the spirit of Mr. G’s Round Hill Lodge, and I’ll go back to that dance floor, juke-box, and all the people I knew as my “Best Friends”, my Lovers, my “Family”. But for now, for today, for this year, this 2018, I want to wish all of you who read this, whether you know or knew G’s or not, the very best that these times have to offer and can give. 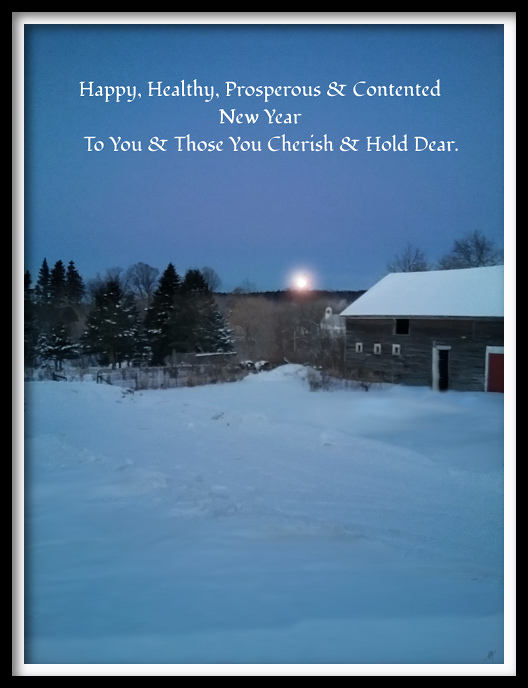 More than prosperity, best health and such, I send out my hopes and wishes for *Contentment*, true happiness, peace, serenity of mind, heart and soul. And with all sincerity, whole-heartedly, I send you my thanks. I’m grateful that I was truly blessed with the privilege of having been a part of Mr. G’s and that Family of good people. Yes, sure, we all had “our moments” when we probably weren’t what most would think of as humanity’s “best”. Admittedly, not EVERYthing was ALWAYS what could be thought of as “perfect”. But HEY! We ALL were, if nothing else… HUMAN. And for the most part, we were Loving Humans, be it for the moment, the day, or how-ever long or short the time. We were Loving… we Loved… one-another, each-other, whom-ever, for what-ever reason. Some of us held onto that Love too… over all the years, never forgetting, never abandoning it. Some of us are still carrying that light with us, through each and every day we continue to take the next breath, and others have taken it with them, “out there”, on-ward to where-ever it is that Creation takes us when we leave this place here. Anyway… again, to you all, each and EVERY one, here’s to another year, a fresh new start, a new opportunity. They say it’s never too late to try new things. Some say it’s never too late to write or re-write your life. This is a new year… an opportunity to start writing or re-writing the “Journal” that will become your life. Hopefully, for those who were at G’s then, whether you choose to write or re-write, G’s will always be a part of your manuscript. I’ve got 62 years of compositions, essays, prose, epistles, a great many pages to my own “Journal” and every one has, some-where, a little bit of G’s, and those whom I cherish and hold most dear. It’s a pleasure, a privilege and an honour to be able to do so. Remember: We might be a “dying breed”, but we’re not ALL dead… yet. 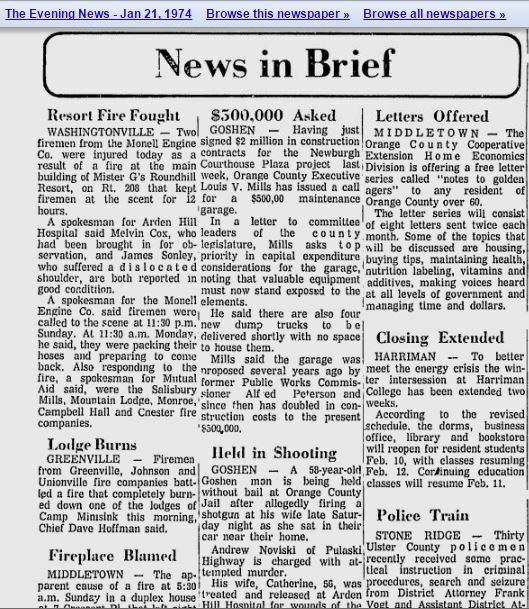 BUILDING BURNS – A large structure at Mister G’s Round Hill Resort n Rt. 208, Washingtonville, was destroyed by fire Sunday night. Here firemen douse smouldering embers. Story Page 5A. WASHINGTOVILLE – Two firemen from the Monell Engine Co. were injured today as a result of a fire at the main building of Mister G’s Roundhill Resort, on Rt. 208 that kept firemen at the scent [sic] for 12 hours. A spokesman for Arden Hill Hospital said Melvin Cox, who had been brought in for observation, and James Sonley who suffere a dislocated shoulder, are both reported in good condition. A spokesman for the Monell Engine Co. said firemen were called to the scene at 11:30 p.m. Sunday. At 11:30 a.m. Monday, he said, they were packing their hoses and preparing to come back. Also responding to the fire, a spokesman for Mutual Aid said, were the Salisbury Mills, Mountain Lodge, Monroe, Campbell Hall and Chester fire companies. On the off chance that, one day, some-how, some-body puts in a search for one of us, MAYBE this page will appear. There were 9 of us, over 40 years ago, who used to get together really rather frequently. I remember us well. I remember “then” very well. And this past week, I was compelled to look for us, in the hopes of getting in touch with those I thought might still be around. Sadly, well, here; I happened to have stumbled upon what I thought was a valid e-mail address of one of the remaining, and with a burst of HOPE, I composed a little message. When I was done typing, I clicked “SEND” and as I reviewed my composition, my “INBOX” registered a new “in-coming”. As I feared: Delivery Failure. The address couldn’t “be found”. So I’m just going to post it here. It’s got the list of names of the other 8. Six are now “gone”, that much has been confirmed. One can verifiably be declared “existent” (or else I shouldn’t be posting this). Hopefully BOTH of the other 2 will find this, or somebody who knows of or remembers any of us will find it and post a reply or response. It’s been a LOT of years, about 13 as memory serves. Haven’t seen you since Bubby’s funeral. And even then, it was briefly. For some reason (let’s call it “Old Age” and have done with it then) memories have been crashing heavily these past few weeks and curiosity got the best (and the worst) of me. Since insomnia’s taken hold, I’ve had a lot more time to gather what few wits I can still claim to be mine and in the late hours, when the world is tucked away, I started to do some wandering, as it were, along the many paths of the Internet. Well… seems I happened upon a place FULL of names that have been most of my heart and soul for the greatest part of my life-time. And, so it would be, those parts are being torn away, and painfully, I have to say in all honesty. It was purely by chance that I came across Bernadette’s name in my searchings, mere months a tad too late. This evening (morning, really), yours appeared! And this e-mail address, in a posting you’d made on the “Record Online” web-site. It’s dated 2/16/2006. Well sir, after another look at the 3 feet of snow on the ground (Winter Storm “Stella” is pouring her wrath on us today) and the blustering snow that still falling, I decided to take a chance that this is still your e-mail address and that it’s actually you, THE Speedy Burns of Lander Street. I can vouch for only myself a the moment as still walking this old world. I’m HOPING that this e-mail will reach YOU at this point, and if it does and you reply, then I’ll know that there are TWO of us left of the group of 9 I recall from “The Top” of old Downing Park and of course, Mr. G’s of Washingtonville. This said, I can’t speak about Dennis. I’ve looked for him too. Of course I have. They say we never forget our “First True Love” and well, it would take more than one e-mails than Hillary Clinton ever deleted to say even a small portion of how I’ve held Dennis in my heart and soul over these 46 years. There are several mentions of him on-line, and 5 or 6 phone numbers. I’ve tried all that I could find to get in touch with him, but they’re either not in service or some other sort of nonsense. Bottom line: As much as it frightens me, I wonder how he is… and “if” he is. The news of Bernadette, I have to admit, has taken quite a toll. Yes, I know and admit that I never suspected or expected that we’d all some-how bump or run into each-other as we all approached the age of 90 or something. But in my remaining silliness, I’ve always taken a bit of comfort in thinking that, aside from Bubby, Ronny and Dolphy, this old world wasn’t exactly “empty”… that some-where on this crusty old planet, SOME (if not MOST) of us were still roaming about (probably wreaking havoc on somebody… as we did oh, so many years ago). Well, as in my heart and mind I meandered through the list… when I thought that out of 9 people, only ONE was verifiably breathing, this place called “Earth” became quite large and quite empty. To put it mildly in perspective: Painfully empty. So tonight (this morning… since it’s 1.30am) I’m taking it as a sign from the Fates that I’ve stumbled upon a way to contact you and taking a chance with this e-mail… the chance that there are TWO of us left… and if you know of recent news of Dennis, maybe THREE. So, Mr. Burns, if I haven’t offended you (or even if I have) by sending this, if you have the time, the gumption, the inclination, know that you’d do an aging soul a great kindness if you’d drop a line in reply. “Hello”. “Who the Hell are you?” “Why are you bothering me?” “Go away old man!” Anything of the sort or kind. And, if you DO know of or about Dennis, that would being a most welcome and wonderful peace to this old heart. I hope, with ALL that I am and have, that this finds you living well, comfortably, safe and Loved. And since you’ve been kind enough to get to this point here in my ramblings, thank you. Oh… and PS: You know… I STILL believe strongly and sternly that you DID win 1st prize in the “Queen of Hearts” competition in 1972 (or was it 1973? I’m old… I recall events, but the dates aren’t too clear of late). With Love and Respect Always…. It was an other-wise miserable, rainy night. Nothing to do around the house, and the urge, ambition and a need to move, to go, to be some-where, do something, just to “go”. And I had a license to drive, having only just recently gotten it, and a rather rare opportunity to use Mum’s “Olds”, the forest-green with faux wood trim, what might have been called, in not too many years prior, a “woodie”, solid colour on the upper part and wood-like pattern on the lower. With the urge to roll and company to share the ride, I suggested to Dewey that we go for a drive. No place in particular. Just get out of the house,. It wouldn’t change the weather but it would change the scenery. Seemed like a good idea at the time, to both of us. We finished our coffee, and out the door, into the drizzle, and onto the roads we headed. First thing in the car, start the engine and the radio. Music. Everything back then (and even today) was accompanied by music on the “AM dial”. “FM” was reserved for parents and grand-parents. “Easy Listening”, as it was called, instrumental versions of dance and romance, set in the scenes and era of the 1930’s, the 1940’s and the VERY early 1950’s. But this evening called for a more contemporary sound-track. The day-light was gone, the atmosphere, dreary. We were on the road destined to no-where in particular, we were alone and there were lyrics to be sung and beats to be bounced to. We listened and, when possible, sang to the radio as we rolled along the dark roads, down, along, to where-ever the roads and whims would take us. Meadow Hill Road to Meadow Avenue and onward to the South Plank Road where it met the park, the pond, the lake, not that we’d stop there this evening, but there we were, at an intersection… with choices of directions… and as we rolled, the windshield wipers flapping, sometimes in rhythm with the tunes on the radio, and other times in contrast. We talked about nothing and everything that came to mind. “So. Where should we go?” I asked, not having a destination and looking for one, just for the sake of having a purpose for the drive. “Do you know how to get there?” doing my best to sound only slightly interested. “Sure. Of course I do.” he assured me. “Washingtonville.” he said, all too simply. OK… I knew how to get to the village, some distance away, off to the South-West. The truth was, I’d tried to find “Mr. G’s” once or twice before but was never successful. I couldn’t imagine where it could possibly be hidden since the village wasn’t at all so large. It was a typical rural little village with all of the businesses located on the main through-fare, and the residents either on that road or just off to either side. A rather typical little rural New York State village. But each time I’d gone in search, I’d driven into, through and out of town, unsuccessful. Ah, but THIS time, it would be different because, here, beside me, was somebody who’d been there many times already and who knew, beyond any doubt, the very way and location. My heart bumped with excitement and anticipation and I did all I possibly could to appear almost un-caring. From where we were, on the South Plank, it would be a bit out of the way and take a bit longer than a direct route from where we’d begun, but it was raining, it was rather dark, it was a dull and dreary sort of evening and there wasn’t any need to rush. I just set my internal map and drove along, as if it were just another trip… oh… to the market or some-where of really no particular interest that was more a necessity than… and “adventure”! The South Plank became the DuPont , the DuPont to the Wisner. Across Broadway, the “Strook” bridge over the creek and at the flashing traffic light at the “T”, a quick right turn here and we were on the Little Britain Road and heading out into the true “rurals”. Back then, in the yester-years, there was precious little in the way of inhabitants once out-side the villages. The road ahead meandered past some acres of what had been, many years prior, old farm-land, along-side the reservoir, and then through scruff and wood-lands, often for what seemed to be miles. Just a lonely traveller (or two), and the untouched world lay before and after. But it was all familiar to me, to us, to those who’d traversed these old roads many times, en route from town to town. The only un-familiar at this moment, was the destination at hand. Dewey gave directions and I never questioned , just followed along. We came to the intersection of Little Britain and the 208… left turn onto the 208 and heading toward the village of Washingtonville, some distance ahead on yet another road through the “nothingness”. The closer we got to town, the more the anticipation welled inside me. But outwardly? I drove along, like a dutiful husband taking the family on an other-wise mundane road trip, singing along with the radio, mostly to dispel the energy rushing round and bouncing about my insides. I was a child heading, full-on, to the “forbidden land”… and it was thrilling! Darkness. Rain. Almost empty roads. “Outlaws” on the move! Pilgrims on the way to the “holy land”. I drove along, watching the road ahead, the side roads, the little parking areas at the now-closed little businesses AND the speedometer on the dash, keeping my foot on the accelerator only enough and no more than necessary to maintain a constant and unvarying 30mph. If, heaven forbid, the grade of the road caused even the slightest increase in our speed, I took every necessary and available precaution to keep from o much as tapping the brake pedal because, touching that would ignite the brilliant red of tail-lights, indicating that yes, I was, in fact, according to local points of view… “speeding”. And THAT was NOT going to happen. “Draw NO attention” was the rule. And forward, on-ward we moseyed, radio volume set at terribly low, law-abiding sojourners, “just passing through” on our way to… any-where BUT G’s. Hey, no problem… not for me, anyway. “Up here, make a right.” Dewey directed, pointing out through the wind-shield, toward what appeared to be nothing other than… woods. I slowed the car, looking intently for any sign of a building, a parking lot, a gravel road, a paved road, some place onto or into which to “make a right”. There was nothing, as far as I could see and then, there it was, to the right, a dirt road. On it’s left was a rather battered wooden sign. To the left and right of the road were the remnants of some kind of once-stately stone-work which now, looked more like neatly piled, local stones and rocks, almost invisible behind the growth of saplings, tall grass and moss. As I turned off the main road and onto the dirt I could see the old sign more clearly through the rain-spotted wind-shield. 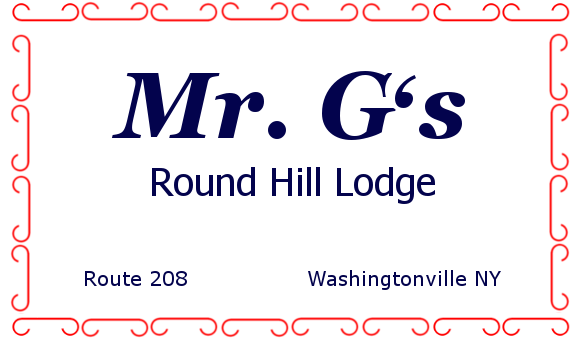 In dark letters it read “Mister G’s Round Hill Lodge”. “But”, I recall thinking, “it’s on a dirt road? Where does this old, dirt road lead to?” I didn’t ask because, well, I trusted that Dewey knew where we were going and he had no reason to mislead me, and, of course, there was the sign. So? Over the muddy old road, trying to dodge the pot-holes, some of which were considerably large, trying to avoid the puddles, some of which were about the size of small ponds. THIS was, if nothing else, interesting? OK. Yes… “interesting” it was. Well then. Since we were obviously approaching the end of our journey here, for some reason I felt compelled to open a dialogue, partly to keep a conversation going, partly to keep myself aware of the surroundings, and partly because I suddenly realised: Dennis might be there when we arrive and, considering his “prohibitions”, having told me, in no uncertain terms that he didn’t want me coming out here, there might be, at some point, a… perhaps… un-tidy confrontation when I was discovered… IF I was discovered. I felt some sort of obligation to fore-warn my comrade. After all, I didn’t deceive him, didn’t coerce him into divulging sensitive and secure information, I didn’t suggest that we come here… but then, I didn’t say “No.” when he brought the place up as a possible destination. It would be “rude” and perhaps “inconsiderate” of me to not inform him of the entire situation and circumstances that might surround my… “arrival”. “Well, now that we’re here, I think I should tell you that I’ve been told that I’m not supposed to be here.” I began, simply as a matter of fact. “What? Who told you you shouldn’t be here? Why not?” Dewey asked, with only a mild trace of discomfort in his voice. “Why didn’t you tell me before?” I could sense a bit of tension in the tone of the enquiry. “If I told you before, would we have gotten this far?” I HAD to ask… more just to keep the chat moving along as the car rolled up and along, swerving here and there to dodge the pot-holes (and the bullet, as it were). I was figuring that the longer I could keep the talk going, the farther along I could get on this single-lane old road, and the closer to My destination I’d get. “Fair enough. But for now, thank you. Really. Thank you. This means a lot to me. I don’t care what I might find or find out here. I just wanted to see the place. That’s all. And I’ll go along with what-ever you tell anybody. I’m just grateful to you. Thank you.” And I was sincere, truthful, in every syllable that I dragged out for as long as I possibly could. Resigned to the fate at hand and what-ever Fate might toss at us, at our arrival, we continued, listening to the radio… Up a hill, round a bend, into the darkness of the woods, through the mud, through the rain, into the night and at the crest of the hill, a turn in the road and… open space! In front of me, a neat stone house. Farther up a bit of a hill and to my left… a large, old, peeling white LARGE, plantation-like house with a full-length porch along the front. The road forked to the right as well and through the rain and darkness, I could just barely see a row of several bungalows, just there, in the short distance. “Mister G’s Round Hill Lodge”! I’d ARRIVED! WELL DAMN! I’D ARRIVED! “Which way do I go?” I choked up and out from my chest. “Well, we might as well go in, since we’ve come all this way.” Dewey said, almost cautiously, as if with some reservation. I didn’t say a word as I pulled the key from the ignition and grabbed for the door. He said “go in” and I wasn’t going to put any time in between “go in” and be in, time for a possible change of mind. I was “IN”! It was strange and yet comfortable, this place. It more resembled somebody’s farm home than a “lodge”. The air, the “atmosphere” was warm, considerably warmer than the night we’d just come in from, almost “heavy” with body heat from all of the people and activity. And immediately I noticed the scent of “Love’s Lemon”, a body spray that was popular at the time and all so, and very familiar to me. VERY familiar… to me. “You don’t have to say you love me just be close at hand. “You’re the first, my last, my everything…” and nothing and nobody will EVER take that away from me.